Lawrence, transportation director at Fairport Schools in Fairport, New York, received Transfinder Corp.’s second annual Ambassador of the Year award. Peter Lawrence (left) of Fairport Schools in Fairport, New York, with his Ambassador of the Year award, stands beside Transfinder CEO Antonio Civitella..
It’s great to be back with Transfinder and I look forward to many years of working with the Transfinder team. Peter Lawrence, transportation director at Fairport Schools in Fairport, New York, received Transfinder Corp.’s second annual Ambassador of the Year award. 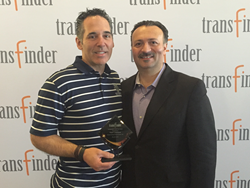 Transfinder president and CEO Antonio Civitella announced Lawrence as the winner at the close of Transfinder’s Annual Client Summit held in Albany, New York. The conference drew more than 200 attendees from 33 states across the country and Canada. That decision served as a wakeup call for the global logistics software developer. Lawrence said Fairport had a good relationship with Transfinder for many years and said the company kept the dialogue even after Fairport was no longer a client. He said Fairport used different products over the years but came back to Transfinder because of the “core aspects of Transfinder and its ease of use. It’s not out there in a lot of products. Lawrence said he was honored to receive the award. “It’s great to be back with Transfinder and I look forward to many years of working with the Transfinder team,” he said. Transfinder awarded the first Ambassador of the Year award to Stephen Janes of Park County, Wyoming, during Transfinder’s Annual Client Summit held in Austin, Texas last year. Janes oversaw the district’s implementation of right-hand-only bus stops for students in grades kindergarten through third grade using Transfinder’s Infofinder I software. The change in those stops results in the likely saving of a young student’s life.